Lives destroyed and a country torn apart by bombings, starvation, and mass human rights abuses committed by a powerful military force backed by Britain. That’s the horror of the civil war in Yemen, revealed last week in a report from a United Nations (UN) panel. The report, released after an investigation by experts, describes human rights abuses committed in Yemen’s civil war. A military coalition—led by close British ally Saudi Arabia—invaded Yemen in 2015 to restore a regime friendly to the West’s interests. Although the report finds human rights abuses committed by both sides, the vast bulk of them are those committed by the Saudi coalition. What emerges is a picture of systematic yet indiscriminate violence—and all with the tacit approval of the US and Britain. For a start there’s the routine brutality, torture and sexual violence. The UN found a pattern of “widespread arbitrary detention”. In prisons and detention centres controlled by coalition, people have been beaten, tortured and raped. Detainees were raped with fingers, tools and sticks. Almost every month there’s news of a coalition airstrike on a market, wedding, funeral, hospital or school bus. Scores of civilians are killed. As the report said, “Coalition airstrikes have been and continue to be the leading direct cause of civilian deaths and destruction of civilian infrastructure in the conflict. It raises “serious concerns” about the targets the coalition chooses and the weapons it uses. The coalition’s blockade on Yemeni ports is also lethal. Since March 2015 imports to Yemen have been restricted. The country imports some 90 percent of its food, fuel and medical supplies. “As of April 2018, nearly 17.8 million people were food insecure and 8.4 million were on the brink of famine,” the report said. “Health-care facilities were not functioning, clean water was less accessible and Yemen was still suffering from the largest outbreak of cholera in recent history. The only purpose is to punish millions of ordinary people to prop up Saudi and Western power in the Middle East. It’s a damning shame on the coalition states that are waging the war—and the British government that backs them. Britain doesn’t just support Saudi Arabia’s war in Yemen—it provides the bombs that are killing civilians. Saudi Arabia is Britain’s biggest buyer of weapons. This strategic relationship helps to prop up the US’s power in the Middle East. The US and Britain ply Saudi Arabia with weapons to make sure they have a heavily-armed ally in a region. Britain is especially keen to play the role of major arms dealer to shore up its own standing as the US’s junior partner. Boris Johnson put it bluntly while foreign secretary. Ditching arms sales would mean “vacating a space that would rapidly be filled by other Western countries who would happily supply arms”. Many Labour MPs are little better. When Labour brought a motion to parliament in 2016 to call for ending arms sales to Saudi Arabia, several of its own MPs spoke against it. For most of them, the main issue was protecting Britain’s “influence” in the Middle East. The motion fell because not enough Labour MPs turned up to support it. Yemen is a country riven with divisions created by decades of imperialist competition and war. At the beginning of the 20th century, north and south Yemen were two different countries. The south was occupied by the British Empire while the north was part of the Ottoman Empire, then ruled by a Western-backed king. Rebellions in both the north and south were brutally repressed. But in 1967 rebels in Yemen drove out the British. The new South Yemen was backed by the Stalinist Russia against the West. When the Soviet Union collapsed north and south Yemen became one country. But nationalist rebels in the south and Shia rebels in the north known as Houthis have both fought for independence. The Houthis forced the pro-West president Abd Rabbuh Mansur al-Hadi to flee to the south. But now Yemen has become a proxy war for competing regional and global powers—with the Houthis backed by Iran, and al-Hadi and the Saudi coalition backed by the West. For Saudi Arabia’s ruler and defence minister Mohammed bin Salman, the more Yemenis killed the better. According to a report on Arab news website Al-Khaleej, bin Salman has told his commanders not to worry about “international criticism”. The coalition occupation has not just bombed civilians in Yemen. It has also targeted ordinary people’s access to healthcare. In 2016 Saudi Arabia stopped commercial flights from accessing Yemen’s airport in Sana’a. “This has prevented thousands of Yemenites from seeking medical care abroad. The coalition has set up its own body to investigate civilian deaths—the Joint Incidents Assessment Team (JIAC). Predictably, its real purpose is to cover up or to distort the many war crimes of the coalition. The UN report found that the JIAC has justified airstrikes on civilians, and that its findings are often altered by the Saudi Ministry of Foreign Affairs. You might have seen it in your newsfeed — devastating reports of a Saudi Arabia-led Coalition airstrike in Yemen that hit a bus carrying children from a summer camp. Media reports state that a nearby hospital received 29 bodies of mainly children. What you may not know is that the United States is supplying weapons to both Saudi Arabia and the United Arab Emirates — two countries committing war crimes in Yemen — and this year the Trump administration is finalizing a $12.5 billion weapon deal with Saudi Arabia. Tell your Member of Congress to immediately stop the flow of arms to members of the Saudi Arabia-led Coalition for use in Yemen. We don’t hear about it much, but Yemen is enduring one of the world’s worst humanitarian crises. This month’s tragedy is the latest in a string of Coalition airstrikes which have indiscriminately killed civilians and targeted infrastructure like hospitals and markets. Countries like Germany, Norway and Belgium have already cut off arms supplies to Saudi Arabia and the United Arab Emirates because of their human rights violations in Yemen. It’s time for the United States of America to do the same. Supplying arms that are being used to kill civilians, including children, is simply indefensible. Please, take a moment now to tell your Member of Congress to stop supplying military exports to the Saudi Arabia-led Coalition, before more civilians are injured and killed. It’s been called the “forgotten war”, but it’s time for Americans everywhere to pay attention. Together, we can influence our government to not only stop arming Saudi-led Coalition forces, but also to use its power as an ally and call for full compliance with international humanitarian law. There are numerous indications besides the federal procurement request that Mattis’ statements of caution to the Saudis were merely public theater aimed at reducing outrage over one of the Saudi-led coalition’s latest atrocities. STOP THIS BRITISH BANK FUNDING THE ARMING OF ISRAEL - PETITION "War on Want"
This brutality lies at the heart of Israel’s systematic violations of Palestinian rights, amounting to serious breaches of international law, and even war crimes. 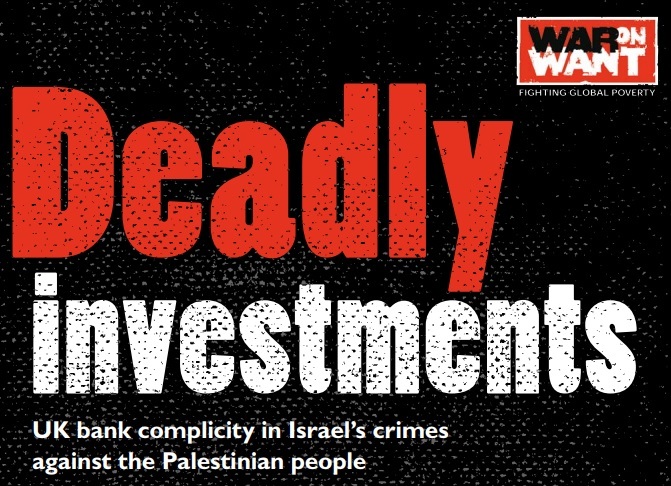 HSBC is a major shareholder in companies selling weapons and military technology to Israel including Elbit Systems, which manufactures drones and surveillance technology, and has recently sold Israel cannons for internationally banned cluster munitions. HSBC claims to have a strict policy against doing business with companies involved in cluster munitions production, but as of 2017, it held £3.6 million worth of shares in Elbit Systems. We can’t allow banks on our high streets to continue lending support to Israel’s militarised repression of Palestinians. Together, we can break the chain of complicity. Tell HSBC to divest from Elbit and all other companies selling weapons used in violence and human rights abuse. Elbit Systems is one of Israel's largest arms companies, and the Israeli military is one of its main clients. Elbit bosses boast that its weapons are 'battle-tested' and 'combat-proven', meaning that they have been used again Palestinians. 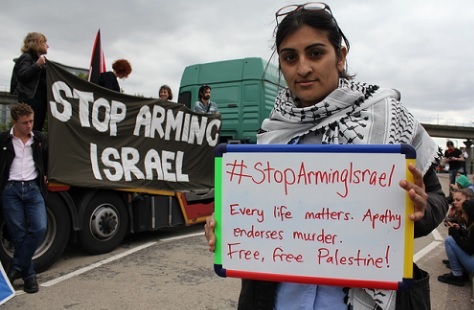 Aside from its Israeli headquarters, Elbit Systems also has seven subsidiary factories in the UK, many of which have been the regular targets of protests and pickets by anti-arms, human rights and peace campaigners. Elbit has also received large UK MoD contracts, and is encouraged to sell its wares at UK government sponsored arms fairs.